Cambridgeshire, Peterborough and South Lincolnshire MIND [CPSL MIND] were delighted to receive a donation of £500 from C3 [Lookout Call]. 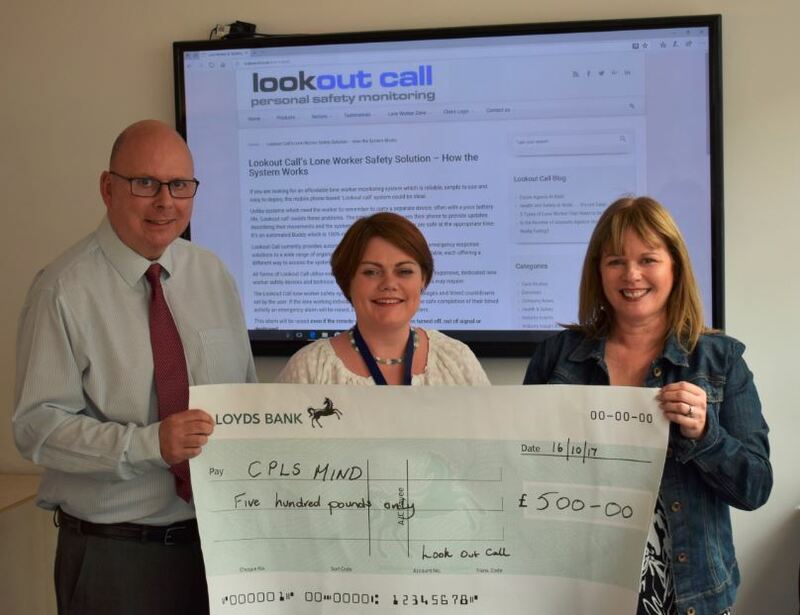 The cheque was presented to Zoe Doherty by Brian Caddy, who said “We are very pleased to support CPSL MIND at a time when mental health awareness is so important and specialist charities like MIND are providing vital services which greatly assist the NHS”. CPSL MIND deployed Lookout Call in 2012 to monitor the safety of its lone workers and their usage of the system [almost 10,000 uses this year] is impressive. Zoe Doherty commented “The increasing use of Lookout Call demonstrates just how busy our community workers have become and how seriously CPSL MIND treats their duty of care”. The charity considered various lone worker systems but chose Lookout Call because the system is easy to use and offers great value for money.